In TS2, pose boxes made it easier to take pictures and make machinima by 'freezing' fidgety sims in a desired position. 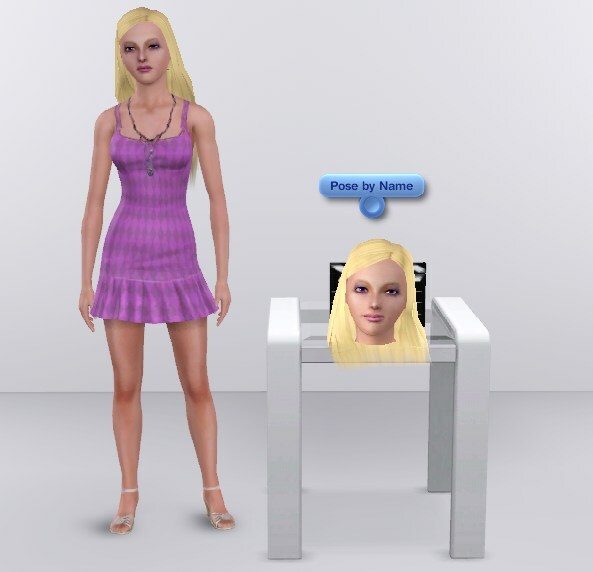 This object is a TS3 version, but it works a little differently. This object plays any installed pose (EA or custom) by name. So, instead of having individual boxes for each pose set, pose sets can be placed in packages and installed, then played by the Pose Player by typing in the pose name. If you post in the comments concerning this issue, it will be assumed you didn't read this and you comment will be ignored. To use the Pose Player, simply buy it in the Decorations/Miscellaneous section (at the starving artist price of $1) and place anywhere on the lot. With the sim you want to pose selected, click on the Pose Player and select 'Pose by Name'. In the text pop up, type in the name of the desired pose, i.e. a_jockPose_x, and click the check mark or press Enter. The sim will do the pose. They will stay posed until the interaction is canceled. 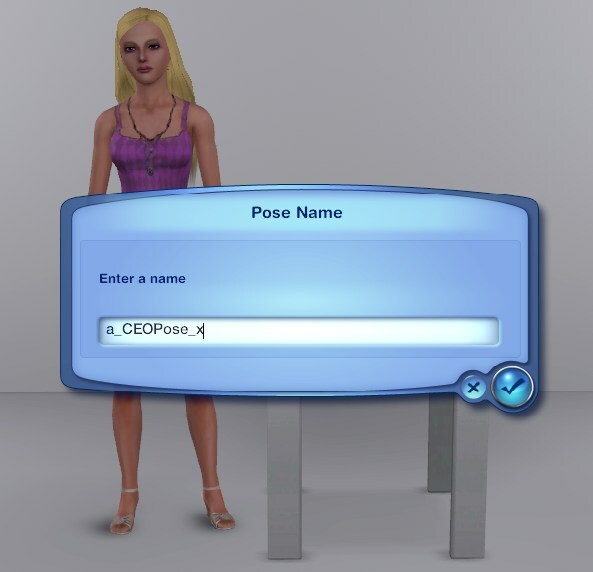 To pose another sim, select them and repeat the process, or choose 'Use current pose' to use the same pose again. If a creator has correctly created his pose package to be found by the Pose Player, the poses can be chosen from a list by choosing 'Select Pose from List'. The list will include all pose packages created for this option, with a thumbnail, the creator's name, and a description of the pose. Only pose packages created to be found by the pose player will be in this list. If you have a pose package installed that does not show up in the list, ask the package's creator to update their package for this option. There is an additional interaction to add a pose from this list to MyList. Pose from My List - Lets you choose a pose from My List to play. Add Current Pose to My List - Adds the currently loaded pose to My List, useful if you've played a pose via 'Pose by Name' and want to add it to the list. Delete from My List - Lets you select a pose from My List to delete. To save the list, make sure you save the game! 5-1-12: Fixed to work on pets(thanks for your help atevera ). Pose from List now can be replayed with 'Use Current Pose' interaction(thanks for the report misusuki). 9-7-11: Fix to pause game while choosing from pose list. 4-14-11:Fixed issue with having to play poses twice to work. 4-11-11: Added 'My List' interactions; fixed plumbbob/headline/motive toggle. Thanks to Orangemittens, Buzzler, Granthes, Leesester, Wes Howe, Atavera, and Inge and Peter Jones. 18644 people have said thanks to cmomoney for this download.